Have you come across the term “managed print services” and wondered how it applies to your small business? Maybe you’ve even noticed an increase in printing from your employees but unsure how to manage it? If you’re like any small business owner, you’ve probably experienced one or more of your employees tying up the printer or copier due to a large print job or project. Not only is this a nuisance, but it may not be the most cost-effective print solution for your small business—and this is where managed print services come into play. Maybe you’re about to start your own business and exploring your options when it comes to business technology and the benefits of certain managed services. If so, this article is perfect for you! Let us first explain what managed print services are. Managed print services (or MPS) is a strategic plan for the printing of a business’ documents. Learn more about a print assessment, here. Once the assessment is complete, a specific plan (unique to your company and employees) is developed to maximize the effectiveness of your business projects. This plan typically includes printer recommendations, such as equipment relocation, updating software and hardware, outsourcing larger print jobs, and auto ordering of supplies. Managed print services is a service provided by many great copier and printer providers to assess, monitor, and manage your printing needs. Wouldn’t it be nice to find a trusting third-party company or team who can better manage the efficiency in your document printing? 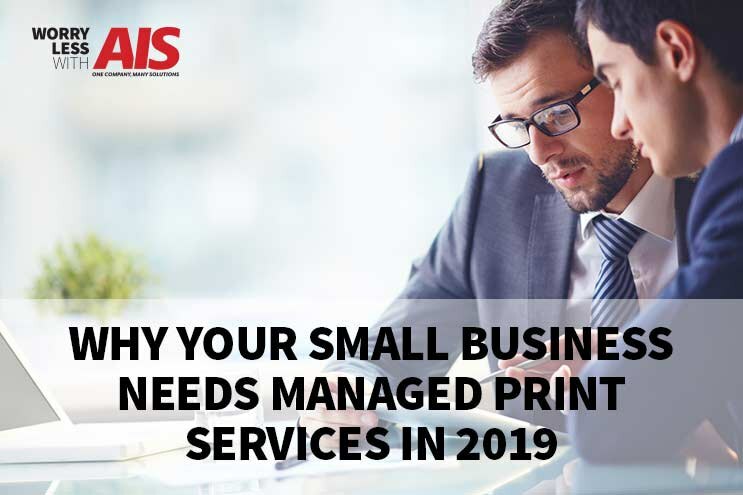 Follow along as we go through the ins and outs of managed print services and the added benefits these products and services can provide to your small business. You might not know why type of printing is going on in your business because you aren’t in front of every copier or printer at all times. Many times, your employees print and assemble such massive projects that really aren’t meant for in-house production. Isn’t it time for you take a step back and a fresh look at how your organization or workflow has changed? You should be doing this every few years, especially if you’re in growth mode. 1. Analyzing Printer Usage: By taking an overall look at your printing usage, paper flow, and the costs of each area in your business printing, you can optimize and create more efficiency. 2. Modify Printer Placement: Did you know that by adjusting the physical placement of your copiers or printers you can make your office be more productive and run more effectively? 3. Picking Up The Right Printer For The Right Job: You may be eating profits or adding unnecessary expenses to your business by using printers that have higher overall operating costs. A well-designed MPS program will make sure this doesn’t happen. In some cases, they can make recommendations for upgrading equipment or replacing legacy equipment to increase productivity an lower costs. There are so many printers to pick from, you can eve find one that matches your particular budget. 4. Staff Training That Won’t Burden Your IT Team: MPS providers can implement additional training when needed on your printing devices, especially when new devices are added, so your IT personnel can stay focused on other projects. Another area that they don’t have to worry about or manage. 5. Reporting: Your MPS provider can design customized reports that you can review at regular intervals for transparency and visibility of your printing needs. 6. Automated Delivery of Supplies: This may seem like an insignificant benefit, but hear us out. By having your managed print services provider automate delivery of toner and other supplies, ensures your machine has minimal downtime. By working closely with your MPS provider, you can quickly identify potential volume spikes over the year so you can stay ahead with your supply orders. 7. Remote Printing Management: More and more of your staff members carry and use their mobile devices, even for printing. Your MPS provider can help you set up and train employees how to print from their smartphones and tablets, even when they’re working remotely or away from the office. To learn more on the benefits of managed print services for your growing business, read an article published by The Plains Gazette, Managed Print Services Market to Set Phenomenal Growth from 2018 to 2026. Your business might not be ready for managed print services yet, and that’s ok! But when you are ready, it’s important to know what to expect once you begin to meet with different managed print services companies. If you don’t have all of this information, they may place monitoring tools on your devices or networks for a short period so they can get a complete picture of your printing usage. A managed print services company suggest that some of your documents be moved to off-site printing companies for additional savings. Their plan and proposal should include the time and money of their services, so they can accurately provide you with the expected costs. After you review and approve of the managed print services plan, recommendations, timeline, and proposal, your MPS provider will begin implementation. As a heads up, the implementation might mean new processes, vendors, tools, and suppliers. However, if you’re open to these changes, you’ll most likely be better off and more informed about your businesses’ printing costs. Your managed print services provider might also want to train your staff on new hardware and software. Because of all the new implementation and processes, your MPS team should provide you with monthly reporting on the printing “health” of your business so you can better prepare for the future while also seeing the return on your managed print services. Partnering with a managed print services company helps keep costs down while also manages your efficiencies in relation to your office printing. Curious on more ways managed print services can help your business, read our article, How Managed Print Services Can Help Manage Print Costs. At AIS, we believe it’s our job to inform you of any and all associated costs when it comes to your office technology. If you think your printing or copying costs are beginning to get out of control, contact one of our business technology consultants, here. Did you know AIS also has a video channel on YouTube? Check us out at The Copier Channel. We’re here to give you peace of mind to help you win more business.